Mantis CTO2001 Compact Compost Tumbler Review: Is It Worth It? Composting is a great way to reduce the amount of waste you produce, while at the same time creating healthy nutrients for your garden. Unfortunately, a lot of people find composting quite a lot of hard work, particularly because it has to be turned over frequently, which also releases some not so pleasant smells, as the decomposing materials are disturbed. However, this doesn’t mean you should give up on composting. Instead, you may want to consider investing in the Mantis CTO2001 Compact ComposTumbler. This composter has been designed to take your yard and kitchen waste and turn it into healthy, rich compost in just a few weeks, rather than the months or even years’ others take. It is made specifically for suburban homeowners and gardeners who are short on space. It tumbles to make turning compost over easy and quick. The ComposTumbler comes with a 22 cubic feet drum, equating to 88 gallons. This means that you can put lots of vegetables, fruits, leaves, grass, and other organic materials inside it. It comes with a large door opening and is equipped with a gear driven handle. This means it is easy to use and doesn’t require a lot of strength. The Mantis composter is also fitted with interior fins, which get to work on mixing all the organic materials as you turn it. Once assembled, the composter measures 43” in height, 42” in width, and 33” in depth. It weighs 60 lbs. when empty. The tumbler is made from rust resistant galvanized steel, which ensures a long lifespan and makes it very durable. It comes in sage green, which means it easily blends in with the natural green materials of the garden. All parts are covered by a two year warranty. Because the drum is enclosed, pets, pests and rodents aren’t able to access the materials. It has an air vent at the top, which means oxygen can always get into the drum, speeding up the overall composting time. It also has drainage vents, so that any excess moisture can easily escape without causing too many bad odors. The door can be fully removed, which allows easy loading and unloading. Furthermore, the Mantis is 100% Made in USA. Interestingly, the ComposTumbler has been around for quite some time. The first model was marketed in the 1990s and had been designed specifically for people who have moved to suburbia and had to make do with smaller gardens and properties. However, Mantis ensured that the speed and quality was exactly the same as larger models, even though the capacity is half the size. The drum itself is made of powder coated, non toxic galvanized, rust resistant steel. It also comes with food grade plastic, BPA free end caps. When you turn the drum, the mixing fins make sure that none of the material sticks to the side. As a result, decomposition takes place more quickly. With the 9.5 bushels of material that the drum can hold, there is plenty of space to make compost for a medium garden. Thanks to the gear driven handle, it is easy to turn the ﻿﻿composter﻿﻿ even if it is full without much effort. Made from galvanized steel, the Mantis has a very long lifespan. It is highly durable and won’t rust. It is quite easy to put the unit together. 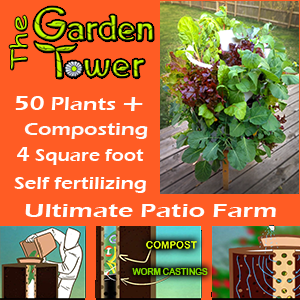 ​The unit is designed to create compost very quickly. It is easy to turn, enabling you to aerate your compost and speed up the decomposition process. The vents ensure that air can always get to the compost, further speeding up decomposition. The fins make sure no materials get stuck to the side, thus, every item you put in your Mantis composter actually gets used. It is a little bit on the costly side compared to other ﻿﻿composters. While it is built to last, the Mantis won’t last forever. Most people are able to use it for around ten years. Galvanized steel is not 100% rust proof, unfortunately. The lid is not permanently attached, which means it can fall off. While this is useful if you want to fill it up or empty it, you could end up with a lot of mess if you forget to latch it properly. Is The Mantis ComposTumbler Right For Me? People with small spaces and who don’t produce too much waste. 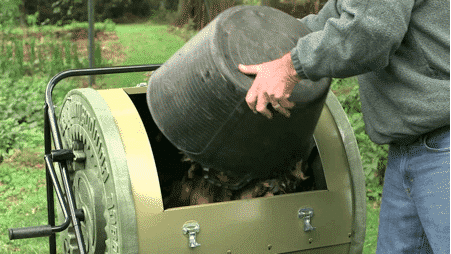 It is a small capacity composter that was designed specifically for suburban households. People with large gardens, or those who produce a lot of organic waste. The drum simply isn’t large enough to hold that much material. That being said, some people have decided to purchase more than one composter, so that they can use one to create compost while using the compost from the other one. Then the Mantis ComposTumbler is right for you! The sage green color means that it blends in to the natural colors of a garden and doesn’t stand out from the crowd. Smells are contained very well inside, and it takes almost no time to turn the bin over once per day, resulting in rich compost in as little as three weeks. Considering traditional composting can take many months to complete, and often requires the addition of certain ingredients, including slugs and worms, this is a great improvement. Because this composting ﻿bin tumbles, the stress of having to manually turn over the materials has also been fully removed. All in all, I 100% recommend this composter. Check Out The Mantis ComposTumbler NOW!